DC Gift Shop would like to take this opportunity to honor the men and women who preserved the freedoms our entire country enjoys every day. As our humble way of saying thank you, we would like to offer these discounted prices on all our items. Our staff has personally selected gift items for you to send or display proudly. Expedited and Overnight shipping is available for most items. 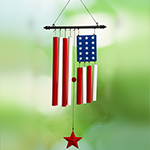 Hang your American Flag wind chime on you porch, deck, or a tree. With a little wind this Star Spangled Banner really sings. Show Your Pride Flag Windchime measures 14 inches by 10 inches and 1.5 inches thick. 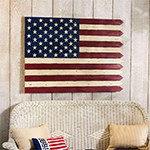 Our large American Flag wall art will stand out and looks great in any room. The stars and stripes are painted on wood fence posts. The hanging flag measures approximately 40 inches by 20 inches and 1.5 inches thick. The United States American Flag Silk Tie is the perfect all-American gift for Dad, a friend, or even for yourself! The wearer is empowered with authority, by making a statement all will recognize, honor, and respect. 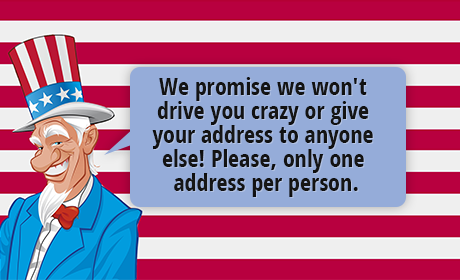 Ideal for patriotic holiday celebrations! Whether you are a dedicated fashionista or someone who wants a little extra warmth in the cooler months, our silk-like polyester scarf is sure to please even the pickiest of patriots. 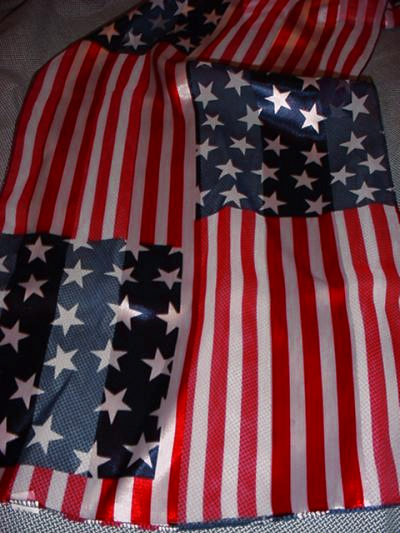 Show your American Pride with this beautiful Stars and Stripes Scarf. This gorgeous American Flag-print scarf is red, white, and blue with a classic Stars and Stripes design. The design will compliment many different outfits and measures approximately 20" x 48".